Jens Böhrnsen (born 12 June 1949) is a German politician of the SPD. From 2005 to 2015, he has served as the President of the Senate and Mayor of the Free Hanseatic City of Bremen, that is, the head of government of the city-state Free Hanseatic City of Bremen. From 1 November 2009 until 31 October 2010 he was President of the Bundesrat and ex officio deputy to the President of Germany. Because of that he was acting head of state of Germany after the resignation of President Horst Köhler on 31 May 2010 and before the election of Christian Wulff as Köhler's successor on 30 June 2010. After voting for the SPD losses of more than five percentage points in the state election on May 10, 2015 Böhrnsen declared the next day that he would retire as head of government. His successor in the office of the Bremen government was Carsten Sieling, who was officially nominated on 18 May 2015 by the Bremen SPD. He is a lawyer by profession and served as a judge in Bremen from 1978 to 1995, when he became a full-time politician. Böhrnsen was born on 12 June 1949 in Gröpelingen, then a workers' district of Bremen, to parents active in the Social Democratic Party of Germany (SPD) and labor unions. His father, Gustav Böhrnsen, a communist turned social democrat, was also an SPD politician and served as chairman of the SPD group in the Parliament of Bremen 1968-1971. Jens Böhrnsen joined the SPD in 1967. At the University of Kiel, he studied law, and concluded his studies with the first Staatsexamen in 1973, and the second Staatsexamen in 1977 at the University of Hamburg. He worked as an assessor in Bremen's administration, thereafter as a judge for 17 years, before he was elected to the Parliament of Bremen (Bürgerschaft). In 1999, Böhrnsen was elected head of the SPD group of the Parliament of Bremen. Bremen's legislative assembly decided to elect Böhrnsen as mayor after he had won the Social Democrat primary for the mayoralty, which had become vacant after incumbent Henning Scherf announced on 28 September 2005 that he intended to resign in December. On his election on 8 November 2005 as a mayor and head of senate of Bremen, he took his oath of office. Recently, Böhrnsen has been involved in the debate revolving around a modernization of Germany's constitution. In the process, he rejected demands for the state of Bremen to merge with Lower Saxony to form a new northern state (a unit within Germany's federal system) — a demand that had been making the rounds as Bremen is not only the smallest German state, but has also been saddled with an extraordinary amount of debt for the past 15 years. After the 2007 state elections, Böhrnsen abandoned the coalition with the Christian Democrats (CDU) and instead started a coalition with the Greens. He is longlisted for the 2008 World Mayor award. 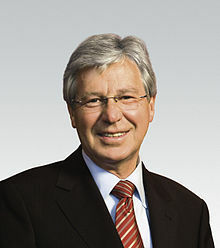 As president of the Senate of Bremen, Böhrnsen was elected President of the German Bundesrat for the year 2009–2010, starting 1 November 2009. This office rotates between the heads of government of the states of Germany following a defined schedule. According to the German constitution, article 57, the head of the Bundresrat is the designated substitute for the President of Germany. When Horst Köhler resigned from the presidency on 31 May 2010, Böhrnsen assumed the functions of head of state of Germany until the election of a successor by a Federal Convention. The successor was Christian Wulff, who assumed office upon his election on 30 June 2010. ^ a b c d e f g h i "Böhrnsen übernimmt Köhlers Amtsgeschäfte". Spiegel Online. 31 May 2010. Retrieved 31 May 2010. This page was last edited on 24 March 2019, at 13:45 (UTC).